Welcome to the Wrangell – St Elias National Park Information Page. The closest major airport is Anchorage, Alaska. There is a smaller airport in Yakutat, Alaska. 1. Take Stateroad 2 South to Stateroad 1 South to the park. 2. Take Stateroad 2 South to Stateroad 4 South to the park. 1. Take Canada Stateroad 1 North to Alaska Stateroad 2 North to Stateroad 1 South to the park. 1. Take Stateroad 97 East to Canada Stateroad 1 North to Alaska Stateroad 2 North to Stateroad 1 South to the park. 2. Take Stateroad 16 North to Stateroad 37 North to Canada Stateroad 1 North to Alaska Stateroad 2 North to Stateroad 1 South to the park. 1. Take Stateroad 1 East to the park. 2. Take Stateroad 1 East to Stateroad 4 South to the park. On 01 December 1978, by presidential proclamation under the authority granted in the Antiquities Act of 1906, Wrangell – St. Elias National Monument was created. It encompassed almost 11,000,000 acres of land in south Alaska adjacent to the Canadian border. In 1980, in the Alaska National Interest Lands Conservation Act (ANILCA), the monument was expanded and redesignated as Wrangell – St. Elias National Park and Preserve. Wrangell – St Elias National Park and Preserve is the largest unit of the National Park Service. 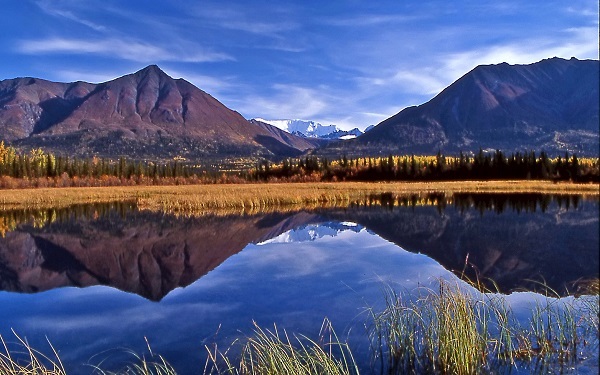 In Canada, adjacent to and contiguous with Wrangell – St Elias National Park and Preserve is Kluane National Park. The two parks together form the largest area of protected land in the world and it has been designated as a World Heritage Site. The implementing language for the 1978 Monument called for preservation of areas with significant geological, ecological, biological, archeological and historic features, among others. The general language of ANILCA echoes the 1978 proclamation. The specific implementing language in ANILCA for Wrangell – St. Elias says that the park and preserve shall be managed to maintain unimpaired the scenic beauty and quality of high mountain peaks, foothills, glacial systems, lakes, and streams, valleys and coastal landscapes in their natural state; to protect habitat for and populations of, fish and wildlife…. ; and to provide continued opportunities including reasonable access for mountain climbing, mountaineering and other wilderness recreational activities. Subsistence uses by local residents shall be permitted in the park, where such uses are traditional. This park and preserve is one of the most accessible in the Alaska Region. The Alaska Highway and the Richardson Highway provide road access to the north and west boundaries of the park while the Glenn Highway provides access from Anchorage. Two rough roads provide access into areas of the park. One, the McCarthy Road (which follows an old railroad bed), runs 60 miles into the southern preserve to the small town of McCarthy and the Kennecott mine and town. The other road, the Nabesna Road, in the northern preserve and 46 miles long, runs to the small village of Nabesna. Access to more remote areas is by small plane, foot and occasionally by pack train. The western boundary roughly follows the Copper River and the eastern boundary is the international border. The far southeastern boundary stretches to the Malaspina Forelands and Yakutat Bay of the Gulf of Alaska. The park is located on the Alaska Highway system and the interior is accessible by two state maintained roads (the Nabesna Road and the McCarthy Road) and by aircraft. The park headquarters visitor center and Slana Ranger Station are accessible. You have to see Wrangell – St. Elias National Park and Preserve to believe it – and even then you are not too sure. The number and scale of everything is so enormous. The total acreage makes this the largest U.S. national park, the size of six Yellowstones. Four major mountain ranges meet here, and includes 9 of the 16 highest peaks in the United States. The high country is covered with snow year round, resulting in extensive icefields and glaciers. The Bagley Icefield is the largest subpolar icefield in North America. Together, Wrangell – St. Elias and the adjoining Kluane National Park in Canada form the premier mountain wilderness in North America. Mountain Biking opportunities are limited in Wrangell-St. Elias National Park and Preserve. Lack of maintained roads and rough, boggy conditions make riding difficult, though the McCarthy and Nabesna Roads are appropriate for mountain bikes. There are no federal facilities in the park. The Bureau of Land Management and the state of Alaska run campgrounds along the Richardson Highway, Tok Cutoff and Edgerton Highway. You may camp anywhere in the park, but be aware that there is considerable private land, particularly along the Nabesna and McCarthy road corridors. This World Heritage Site includes many of the highest mountains and largest ice fields in North America. The setting provides for superb mountaineering experiences found nowhere else in the world. There are no admission or user fees for non-commercial users. Fish are one of Alaska’s greatest renewable resources. By practicing proper catch and release fishing, today’s anglers preserve quality fishing for the anglers of tomorrow. Full service groceries are available in Anchorage and Valdez. Most food and supplies are available in Glennallen and Tok. Limited supplies are available in Chitina, McCarthy and Slana. There are no maintained trails in the park, but several hiking routes and abandoned roads lead deep into the park. Kayaking is a popular activity in the park. There are no federal facilities in the park. Several private lodges and bed and breakfast establishments are located along the McCarthy and Nabesna roads, in McCarthy and Kennicott, and in the highway communities. The Bureau of Land Management and the state of Alaska run campgrounds along the Richardson Highway, Tok Cutoff and Edgerton Highway. You may camp anywhere in the park, but be aware that there is considerable private land, particularly along the Nabesna and McCarthy road corridors. There are no permits required for non-commercial uses. Reservations are recommended for most visitor services from commercial vendors. This is a park for wilderness oriented activities. Besides sightseeing, major activities include backpacking, hiking, camping, hunting, fishing, mountaineering, river running, sea kayaking in protected bays, and cross country skiing. There is a visitor center at park headquarters, Mile 105.5 Old Richardson Highway. Smaller exhibits and informational displays are located at the Yakutat, Slana and Chitina ranger stations. The weather is like that of most of Interior Alaska. Summers are cloudy and cool, but clear, hot days are not uncommon in July, the warmest month. August and September tend to be cool and wet, but with fewer mosquitoes. Fall can be delightfully clear, but the season is short. Winters are cold, with temperatures dropping to 50 below zero. Average snow cover in winter is two feet. In the spring, clear skies, increasingly longer days and warming temperatures break winter’s hold on the land with dramatic quickness. Throughout the year, the weather can change quickly, so it is wise to pack for any season with clothing that can be layered, ready to peel off or add as conditions dictate.